India Drops in Global Competitiveness - Swiss Tops! It is strange, but looks like India is not able to keep up with world when it comes to competitiveness – For 3rd straight year, India has fallen on competitiveness rankings. In 2009, India ranked 49th amongst 142 global economies in competitiveness, in 2010 we fell two places to 51 and this year witnessed even bigger fall of 5 places to 56th most competitive economy in the world. For a country, which is being talked about as an emerging superpower, this is something that needs to be looked into seriously. And as usually is the case, the biggest culprits for such low rankings are India’s infrastructure, corruption & bureaucracy. China, on the other hand has been consistently making progress over past decade and has been rising on competitiveness index and is currently ranked 26th in the world. If you compare China with India, the gap between them is widening – the score difference between the two economies has increased six fold between in last 5 years alone! One can argue that India being a democracy, and a very large one at that, it is a very difficult and slow process – but it cannot afford to be left behind its peers. It is quite telling when India is ranked 3rd in the world for its market size, but 105th out of 142 countries when it comes to Macroeconomic Conditions. So, we do rank well in a few areas, but our ranking in majority of areas are far from ideal and the worst part is that they are falling further! 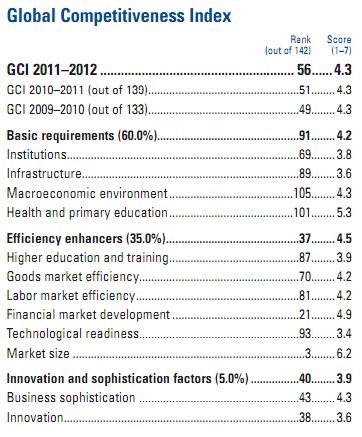 You can read the entire WEF Global Competitiveness report here for 2011-12.